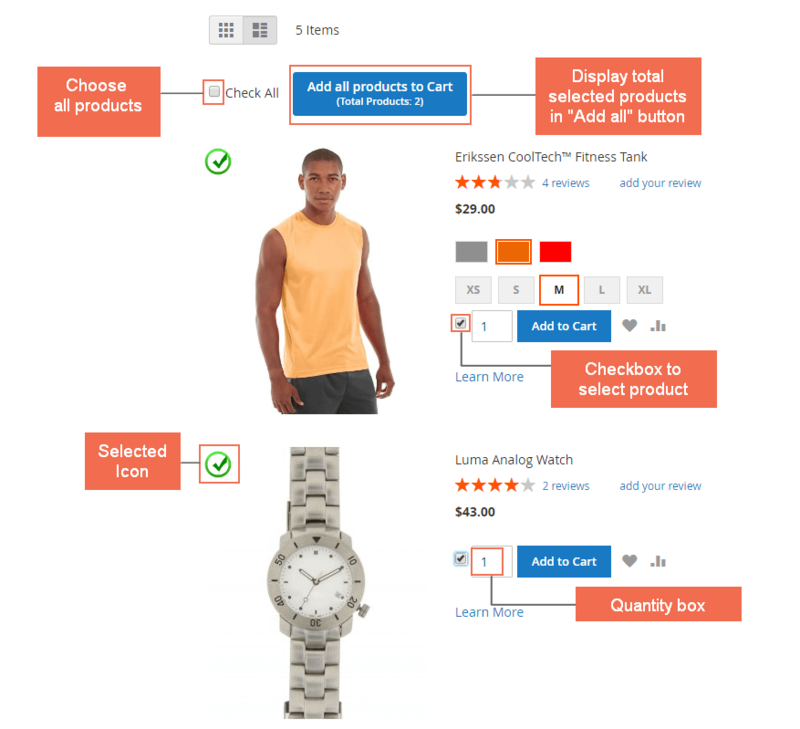 Add Multiple Products To Cart for Magento 2 extension allows customers to add multiple products to cart at once without visiting product pages separately. This Magento 2 Add Multiple Products to Cart feature can be applied for various product list pages (category page and search page) or can be added to cms pages using widget. Support bulk ordering by using checkbox, quantity box and “Add all to Cart” button. Ajax popup function to select product options. Success popup with details of products added to cart. After the success of Wholesale Fast Order for Magento 2, BSSCommerce continues developing extensions which simplify purchase process for wholesale and B2B business. With the new Add Multiple Products To Cart for Magento 2, customers now can add many items to cart right on the category, search result page and homepage. Select multiple products to cart at one time by using checkbox, quantity box and selected icon. Checkbox and quantity box are available for each product so that customers can select a lot of items Moreover, “Check all” button supports to choose all displayed products in the fastest way. Once being picked, the item will be shown with an icon for buyers to notice. “Add all to cart” button supports mass order in wholesale and B2B. The total selected products number shown on “Add all to cart” button is continuously being updated when the buyers shop for more. Just a simple click on it, everything will go directly to cart. This is especially very convenient for mass selection in wholesale and B2B order. 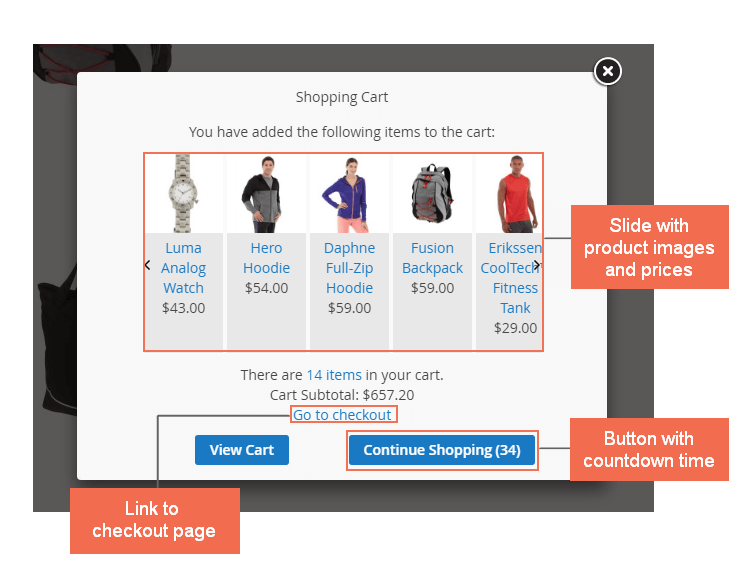 Display a success popup including product details with checkout link and buttons for next actions of customers. The purpose of this popup is confirmed to customers about products which was successfully added to cart. The popup includes product details such as images, prices, links together with a mini cart with subtotal and link to checkout page. Customer can also add a lot of products at once in the Grid view with the same steps as in the List view. Work with all product types. Admin can choose specific Customer group to apply the module. Manage the design and content of button and pop-up. “Add all to cart” button is freely to be set up for the displaying position and either total quantity or total products to be shown. 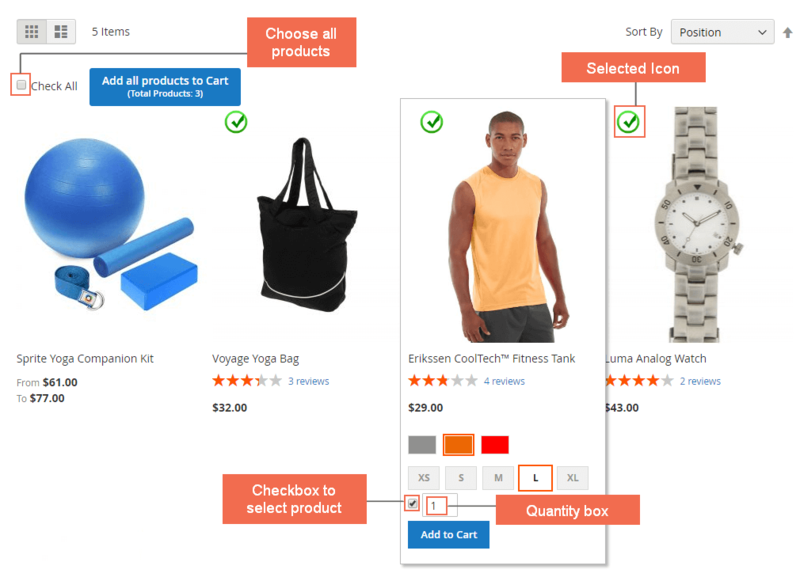 Admin can make choices for displaying elements in the shopping cart popup after adding products to cart: images, slider performance , product links, minicart and other buttons. The module can be applied for any place in Magento 2 store not only product list pages and homepage. 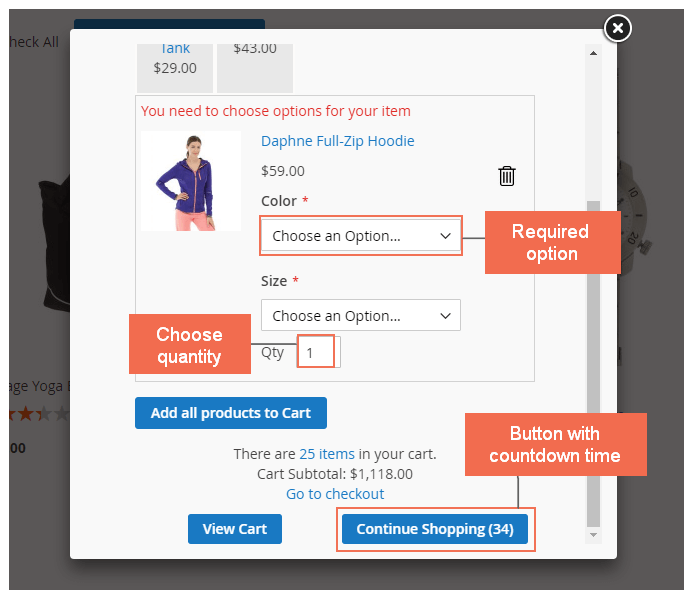 Why Add Multiple Products To Cart for Magento 2 is a must-have extension ? The simpler the purchasing process is, the more customers you can attract. In the default Magento, the buying procedure gets complicated when customers have to visit each product page and add to cart separately. But with Add Multiple Products To Cart for Magento 2, this would no longer be a problem. Customer now can have a more enjoyable time shopping on your store as it requires less time and offers an effortless process. The extension allows customers to choose multiple products at once which is especially a great choice for wholesalers. Hence, having this module on Magento store is a must-have choice for wholesales businesses targeting for increasing in sales and profits. Configuration of this module is developed to be friendly with admin with easy-to-change set up. A detailed user guide is also provided to help you understand more about this module and be able to resolve some problems by yourself. Moreover, our team at BSSCommerce with the experienced developers and enthusiastic staffs is always available to assist you on the installation and usage of the extension. Everything works well. When we have an issue, your support team is always quick to respond. Thanks. Hi. I've checked Add multiple products to cart extension on market and this one has most amazing features. Great work. My customers got better shopping experience with this extension. The 2 pop up make the UX a lot better. You can get use of the AJAX pop up for adding a single product to cart which is convenient for buyers. The fix of Price Excluding Tax when choosing options of configurable product is great! The module is featured the Ajax popup and works for even only one product added to cart. You can save cost from this. Great extension - Big help! A great extension at a reasonable price! Highly recommend it for anyone who is having trouble with how to make the buying process less complicated. I received lots of positive feedback from the customers after installing the module. The support team did an amazing job,too! Thank you, guys! v1.0.7: Fix error of duplicate display id in console of chorme browser; Fix issue when "Position of "Add all products" Button" is set to "Right (Scroll)" then the bottom row of products on a catalog page will be partially cut off. How To Add Multiple Products To Cart For Magento 2?